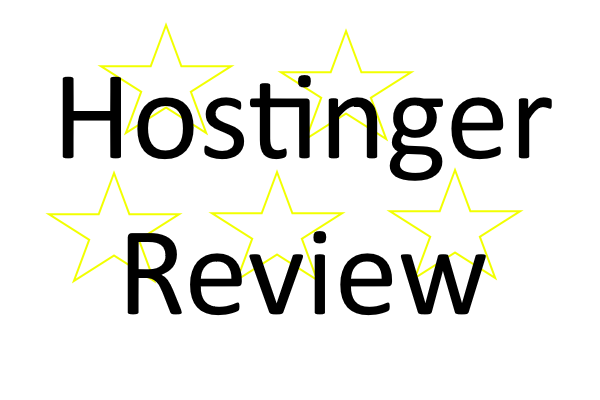 This is Review Signal's FIRST review of a web hosting company! I hope you're excited. 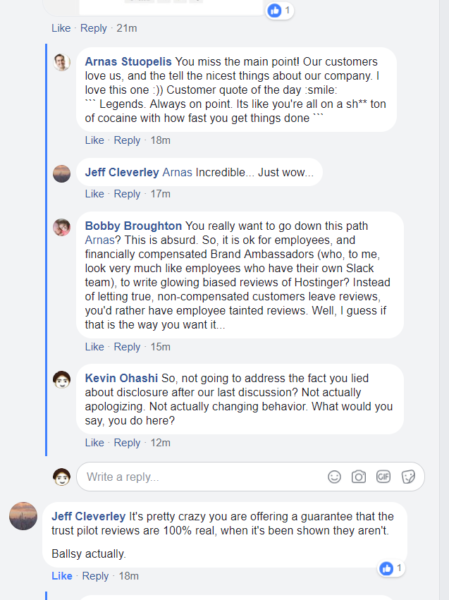 This is a follow up to our original blog post exposing Hostinger's fraudulent reviews which were encouraged and defended by their CEO. Most companies would reconsider their behavior after being caught and called out so publicly. 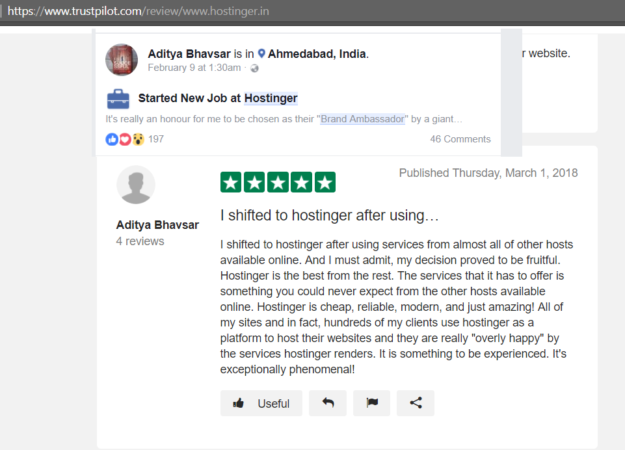 But Hostinger is a special kind of company. The kind where the CEO seems pathologically intent on deceiving customers and passes his values down the corporate chain. Hostinger's follow up performance was their notorious 'brand ambassador' program. Screenshots below take place on the WordPress Hosting group on facebook around April 19, 2018. This 'brand ambassador' was caught within an hour of posting. One Hostinger rep jumps in to defend this practice (Daugirdas Jankus, a familiar name if you read the first article). The 'brand ambassador' also tells us there is 32 brand ambassadors in this program. Their CEO, Arnas Stuopolis joins in as well. The entire thread devolves into a joke with their brand ambassador embarrassing himself. Arnas doesn't do his company any favors either. He even tries to use Hostinger's TrustPilot rating to defend himself. Yes. The very same ones from the last article which exposed his employees were manipulating with his blessing. The full thread can be read here (warning: long). Then the next part of the saga starts with Arnas Stuopelis issuing a statement to the group. He uses the same lines, including defending their Trust Pilot reviews which were manipulated by their employees. He gets called out immediately, because he's lying. Of course I had to go grab a screen shot as he made these statements. 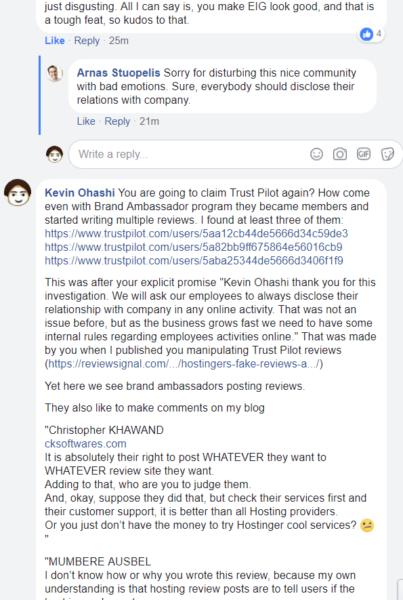 His 'brand ambassadors' are also posting reviews on Trust Pilot. Posted after he became a brand ambassador of course, wouldn't want to think a legitimate customer posted a review and then became an ambassador after all. Of course, this was brought up with him at the time as well. I lay out the evidence. 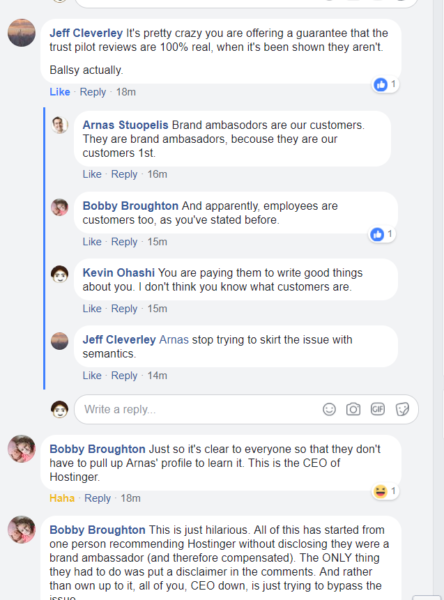 Multiple 'brand ambassadors' posting in multiple places (including commenting on here on Review Signal) trying to promote Hostinger. Posting fake reviews. Hiding their relationships. The exact behavior that got them in trouble the first time. 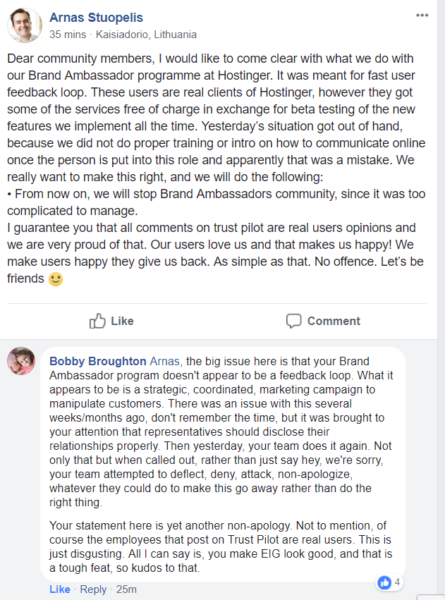 Just like their employees are customers, brand ambassadors are customers too and he seems to believe they should be feel free to spam communities all over the internet. Does this sound like customers who are getting to try new hosting features? He's responsible for working as a team with other brand ambassadors (and Hostinger staff?). The growth of our company. Doesn't sound like a customer at all, smells like employee. Our friend Christopher Khawand also started a github repo called hostinger-ba-dashboard. Why these guys are listing it as a job on LinkedIn, Facebook and resumes? 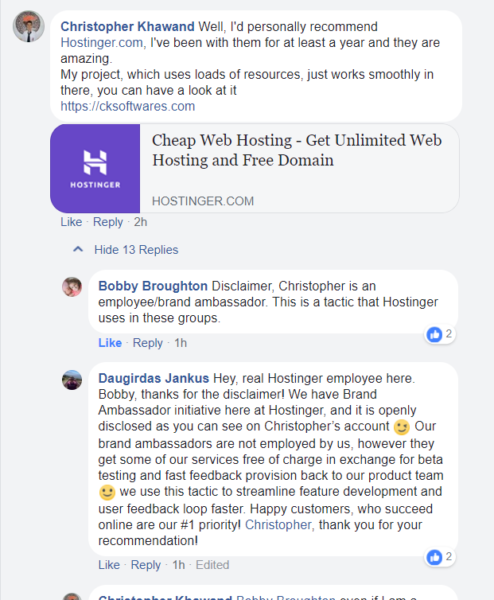 Why are they building software for Hostinger? Who is team drago? Why is Christopher also posting reviews on HostingFacts, TBWHS, whoishostingthis, their own review site and more? Does Mumbere Ausbel post more than a russian troll factory? 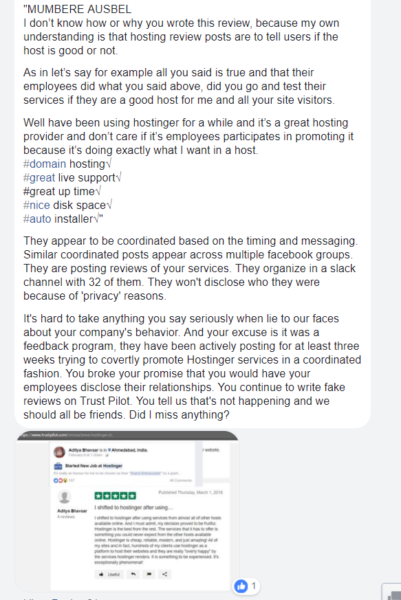 Hostinger was banned from the WordPress hosting group on facebook for their repeated and calculated deception of an entire community. Good riddance. I thought this saga was done. 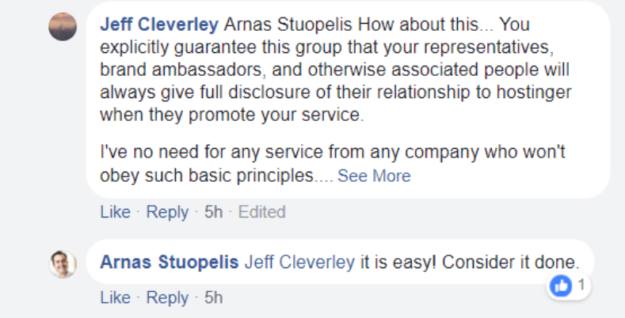 Arnas Stuopelis said the brand ambassador program was shut down. Why would should anyone believe this liar? Guess who I found on Quora (posting as recently as July 20, 2018)? Guess you missed that I dig up web hosting spam networks on Quora too. So much for actually shutting down your program, these 'brand ambassadors' (spammers, shills), are back at it in coordinated fashion. My Hostinger Review: avoid with a 100 foot pole. It's hard to in conscience believe a company so intent on lying to people is a good company by any definition of the word. Their CEO is happy to lie to people's faces about facts. His employees are happy to do the same. They spend a lot of time coming up with ways to manipulate communities into believing they are good by astroturfing (brand spamdassadors). 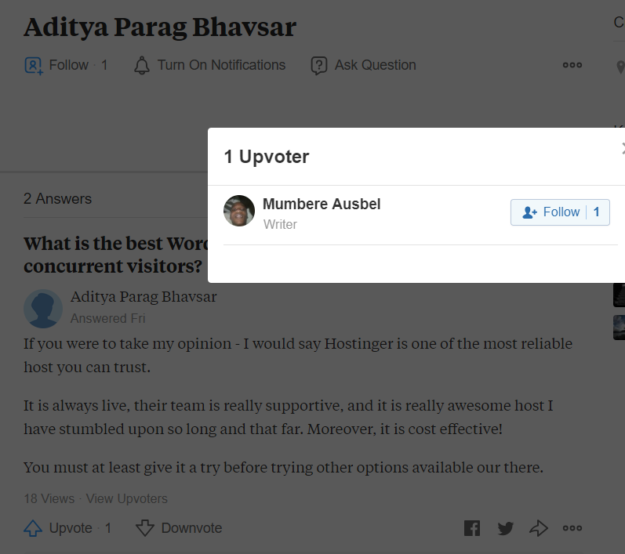 Hostinger is a company anyone with a sense of ethics should steer clear of, 0 stars. This entry was posted in Featured, Web Hosting and tagged dirtyslimyshady, hostinger on July 22, 2018 by Kevin Ohashi. I am in deep! I do not know why this is so “can’t-stop-reading-utterly-fascinated-and-angered-by-this-CEO”!! Have you done reverse image searches on their profile pics? Nope, did you find something?